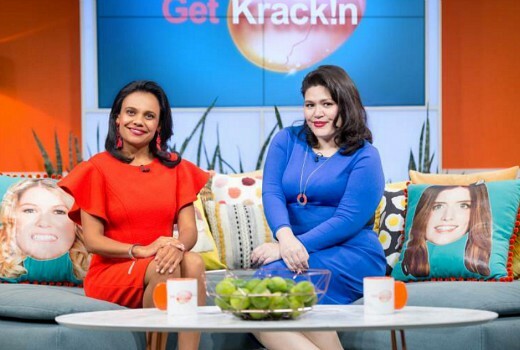 Guestk favourites, Miranda Tapsell and Nakkiah Lui return to promote the new season of their network show, The Blynde Spot. But when the Kates suddenly leave mid-interview, their guests are, once again, left to steer the leaky and rudderless boat that is Get Krack!n. Miranda, keen to diversify her skill-set so she stops getting confused for Deborah Mailman, embraces the opportunity to host the show. And eventually, she convinces a reluctant Nakkiah to stay and claim her role as ‘Australia’s Aboriginal Sonia Kruger’. And so with new outfits, new hair, new makeup and their bodies squeezed into second — hand shapewear, Nakkiah and Miranda present a running order filled with segments on mudrooms, laundry detergents and and an all-white panel discussing whether or not racism is “a thing.” The only reprieve comes when they check in with intern Scarlett Nicdao who is reporting live from The Kates’ location. There The Kates negotiate both an unfolding situation and the handful of confused guests who were redirected to them. Wow, what a finale! Brilliant work from Miranda and Nakkiah. Come back soon, Kates, you will be missed. The writing on this show is so sharp and on point. Have really enjoyed it and can’t wait to see what the Kates do next.